Paula Shaw, founder of the Trio Capriccio, has BA and MA degrees from the University of Washington, Seattle, and studied music at the University of Minnesota. While in Minnesota she studied chamber music with Tanya Remenikova and violin and viola performance with John Tartaglia and Shirley Santoro. She also performed with the Lake String Quartet of Minneapolis, the Civic Orchestra of Minneapolis and the Minneapolis Chamber Symphony. Since moving to New York she has studied with Dr. Laura Klugherz and been a member of the St. Cecilia Orchestra and the Schenectady Symphony, served for one year as concertmistress of the Glens Falls Symphony and was a member of the Albany Symphony for 17 years. She also played with the Berkshire Opera Festival and the Shaker Mountain Music Festival. Touring companies Paula has played with include the Northwest Ballet, the Joffrey Ballet and the New York City Ballet. She has played orchestral backup for numerous popular shows including Maurice Hines, Garrison Keillor, The Moody Blues and YES. Paula teaches privately in her home and at Union College. Barbara Lapidus is a graduate of the Crane School of Music, Potsdam, NY and has completed selected graduate curricula in music from Syracuse University, Syracuse, NY. Ms Lapidus is currently a violinist with the Albany Symphony Orchestra and has been awarded a stationary position in the orchestra. She has performed with the St. Cecilia Orchestra, the Berkshire Opera Festival and the Schenectady Symphony. She has performed in a broad range of settings including: orchestral backup for Broadway-on-Tours, popular concerts at Saratoga Performing Arts Center, the Schenectady Light Opera and local choral societies. She has played numerous weddings and functions in the capital area. Ms Lapidus teaches violin in her studio in Niskayuna, NY. 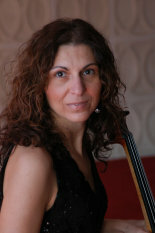 Born in Bourgas, Bulgaria, Petia Kassarova began studying the cello at the age of ten. She attended the Bulgarian Conservatory where she studied with Prof. Zdravko Jordanov, a student of Mstislav Rostropovich. During that time she worked in the Vidin Philharmonic and toured with the orchestra in Western Europe. In 1992 Mrs. Kassarova accepted the principal cello position in the Orquestra Sinfonica de Ribeirao Preto, Brazil. She was also a professor of cello at the Music Academy of Ribeirao Preto. In 1993 she attended Duquesne University School of Music pursuing an Artist Diploma with cellist Jennifer Langham, a student of Janos Starker and Gregor Piatigorski, and with Morris Genrom. Petia holds a Masters degree from the University of Massachusetts. She has been a member of the Albany Symphony since 1998 and holds a stationary position in the orchestra. Petia has performed with many orchestras such as the Festival Orchestra of Brazil, Ohio Light Opera, the Syracuse Symphony, the Key West Symphony, Glimmerglass Opera, and many regional orchestras. She has been a member of the chamber group Musicians of Ma'alwyck since it's founding and is also on the faculty of Schenectady County Community College.